On page 17 of the September 2005 Insulation Outlook, it says: “In fact, no hydropower energy sources require insulation, nor do hydrogen, solar, and wind sources.” This statement from over a year ago reflects the excessive attention going to renewable electric technologies and the misconceptions about solar thermal energy. The following article is the first of a short series on solar technologies and the possible opportunities for the insulation market. A new, unexpected source of business in the renewable energy arena is solar thermal energy systems. Solar energy? Not since the 1970s has there been such a buzz about solar energy and other renewable energy technologies. Most of the attention has been on wind and photovoltaic solar electric systems. However, for the insulation industry, a growth market could be on the horizon for solar thermal energy systems. Solar thermal energy systems are very versatile and can deliver temperatures from 100° to 1,000-plus°F. They cost 75 percent less and deliver more energy per square foot than a photovoltaic (PV) system. Since they generate heat for water, air, electric power, and cooling or refrigeration, they need insulation. Troughs are used for commercial water heating and for electric power, dishes for electricity using Stirling engines or concentrator PV, and central receivers—a field of tracking mirrors focused on a tower—for 50- to 200-megawatt (MW) electric power plants. In parabolic trough electric power plants, the power cycle temperatures are 550°C and 735°C. Since 2001, wind has probably doubled in installed capacity, and PV panel sales have risen about 35 percent per year, but from a small base. Solar thermal remains the largest deployed technology, but the United States is lagging far behind Europe and other countries. In Europe, 1.2 million square meters of glazed, flat-plate solar thermal collectors were newly installed in 2003. In comparison, U.S. manufacturers only shipped 52,025 square meters of these medium-temperature collectors that same year. According to the European Solar Thermal Industry Federation, in 2005 Europe installed another 874,258 square meters of collectors (1.2 million kilowatts) of solar thermal energy systems. China was reported to have installed 10 million solar water heaters in 2004, and its solar thermal market is growing rapidly. The U.S. market for residential water-heating systems has been less than 20,000 systems per year, but with new incentives in place it is poised to grow more rapidly. What solar companies have barely tapped into are opportunities in the commercial, institutional, and industrial sectors for solar thermal systems. Larger system sales will help the solar market grow faster. The federal government is creating a modest amount of demand pull now through executive order requirements that federal agencies meet targets for deploying solar systems. Energy service companies are starting to turn to solar companies in response to solar requests from their federal facility clients. For example, for government facilities, Industrial Solar Technology in Golden, Colorado, has installed several large, flat-plate systems with up to 12,000 square feet of collectors and a 45,000-square-foot trough system. It has also just completed a new 60-ton solar heating and cooling system with 7,000 square feet of parabolic troughs for a community college in Arizona. Capital Sun Group has just gotten contracts for five solar systems, four of them thermal, for the federal government facilities through one energy service company. Also, they have a contract for a solar water-heating system for the Department of Health and Human Services headquarters in Washington, D.C., through another energy service company. This trend will continue and should stimulate more nongovernment commercial-sector growth in sales. The solar thermal electric power market appears ready to be reborn. 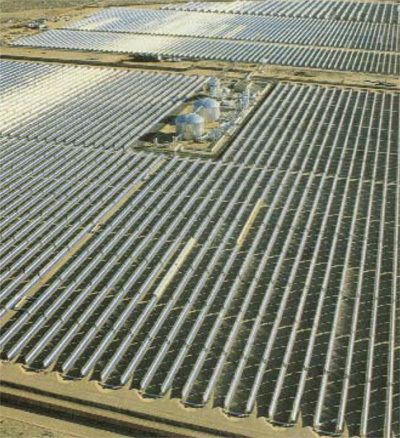 Before its financial problems caused it to cease operating, Luz International built 354 MW of parabolic trough electric power plants in California. Constructed from 1984 to 1991, these systems employed more than 27 million square feet of collectors and tens of miles of insulated pipe. Although well proven, the technology languished over the last 15 years until utilities ordered new plants to meet state regulatory requirements supporting solar deployment. Solargenix in Raleigh, North Carolina, completed a 1-MW trough electric power system in Arizona in 2006 for Arizona Public Service Company. In Nevada, Solargenix is now building Nevada Solar One, a 65-MW parabolic trough power station. On a site 1 by 11/2 miles, this solar collector field will use large-diameter steel pipe for thermal energy transport that will be insulated with 1- to 11/2-inch fiberglass and calcium silicate. The amount of insulation in this one project could add up to 4 to 6 linear miles. The Nevada project was driven by state regulation that established a renewable energy portfolio standard (RPS) that requires utilities to generate or purchase a certain percentage of their electricity from solar energy. For large-scale electricity generation, parabolic troughs are less costly than PV systems, and an easier path to comply with the RPS than working to get consumers to install thousands of residential PV systems. Other states with RPS requirements are Arizona, California, and New Mexico, and trough electric systems will be in the planning stages there as well. The largest solar thermal electric capacity exists in the United States, but overseas sales are beginning as well. In Spain, a 50-MW trough plant is planned and a 45-MW central receiver facility will also be built. Through a variety of circumstances in the United States, energy policy has not provided solar thermal energy technologies with the same level of market support as PV, which gets the largest share of federal research and development (R&D) funding among renewable technologies. Since it is a mature technology, the R&D needs for flat-plate solar thermal technologies are minimal, but there are still innovations that could help lower costs and speed market penetration. A new era for solar is opening, but a need exists for more aggressive support for solar thermal technologies. Insulation companies, manufacturers, and contractors should seek out solar companies to get on board with what is a growth industry overseas and will become one in the United States. By doing so, they will help this industry gain the attention it merits and stimulate more growth. Subsequent articles will follow in future issues with more detailed information on solar thermal technologies and the market.